If the oldest image of a domesticated horse can be traced back to the Sumerian civilization, the earliest written text dedicated to the care and training of the horse is the one by Kikkuli, squire of the king of the Hittites Suppiluliuma, dating back to a period between 1375 and 1335 BC. It was found engraved on five clay tablets in cuneiform characters, among the thousands brought to light during the excavations conducted by Hugo Winckler in the site of Boghaz-Koy, in Central Anatolia, in 1906.The text is a kind of a manual for the care and training of the chariot horses of the Hittite army. At that time, in fact, the cavalry was still relatively unknown to the civilizations that flourished around the Mediterranean. The text describes a detailed training program, lasting 184 days. For each of these days were prescribed the rations of feed, the number of watering, the workouts and the periods of rest. The horses were yoked to the chariot and trained up, walking, ambling and cantering. They were also walked wearing blankets to make them sweat and taken to the river to bathe and swim. The diet consisted of grass, clover, straw, barley and mashes of cooked cereals, but the program included as well days of complete fasting. The horses were initially selected subjecting them to quite intense efforts in the first days, then they were moved on to a progressive work, coming to travel up to sixty miles a day, at different paces. They were trained in pairs, as they were usually joined in pairs. 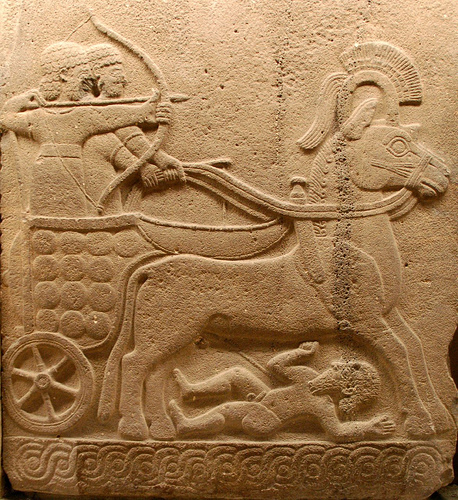 Generally chariots carried three people: a charioteer and two warriors, one armed with a bow and a spear and the other on with a spear and a shield. 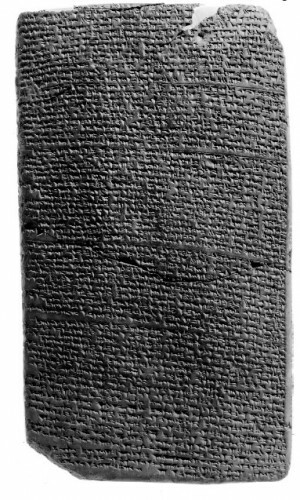 The author, although was serving a Hittite king, said that he belonged to the people of Mitanni, a kingdom located in northern Mesopotamia, which reached its peak in the late Bronze Age and was defeated by the Hittites. Its inhabitants were famous for their ability in taming horses. The text of Kikkuli has recently been translated in English and has inspired a training method for endurance horses, that’s based on his instructions. NEYLAND, Ann, The Kikkuli method of Horse training, Mermaid Beach, Smith and Stirling, 2008. Fascinating to read about this. It makes me love the horse in history even more…thank you for taking the time to post this! Thank you Connie! I’m glad you like this article. There are new are new posts coming up, so please come back to visit the blog for updates. Ciao! mi fa davvero piacere che il blog ti piaccia. Spero davvero che continuerai a seguirlo. A presto!